Periodontal (gum) disease is a serious infection that can damage more than periodontal tissues — supporting bone structure is also at risk. Any bone loss could eventually lead to tooth loss. To stop it from causing this kind of damage, we must match this disease's aggressiveness with equally aggressive treatment. The various treatment techniques all have the same goal: to remove bacterial plaque, the source of the infection, from all oral surfaces, including below the gum line. Buildup of plaque, a thin film of food particles, after only a few days without adequate brushing and flossing is enough time to trigger gum disease. The basic removal technique is called scaling, using hand instruments called scalers to manually remove plaque and calculus (hardened plaque deposits) above or just below the gum line. If the disease or infection has advanced to the roots, we may use another technique called root planing in which we shave or “plane” plaque and tartar from the root surfaces. Advancing gum disease also causes a number of complex problems like abscesses (localized infections in certain areas of gum tissue) or periodontal pockets. In the latter circumstance the slight normal gap between tooth and gums becomes deeper as the tissues weaken and pull away. This forms a void or pocket that fills with inflammation or infection that must be removed. Plaque buildup can also occur around furcations, the places where a tooth's roots divide off from one another. It may be necessary in these more complex situations to perform a procedure known as flap surgery to gain access to these infected areas. As the name implies, we create an opening in the gums with a hinge, much like the flap of a paper envelope. Once the accessed area has been cleansed of plaque and infected tissues (and often treated with antibiotics to stop further infection), the flapped tissue is closed back in place and sutured. To avoid these advanced stages it's important for you to see us at the first sign of problems: swollen, red or bleeding gums. Even more important is to reduce your risk for gum disease in the first place with dedicated daily brushing and flossing to remove plaque and regular dental visits for more thorough cleaning. 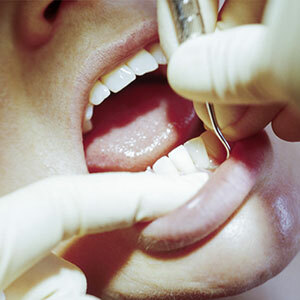 Gum disease can be devastating to your long-term dental health. But with diligent hygiene and early aggressive treatment you can stop this destructive disease in its tracks.